You’re a bodybuilder. You put in a ton of effort to take care of your body and improve your health. But how do you know that the supplements you take work for you rather than against you? 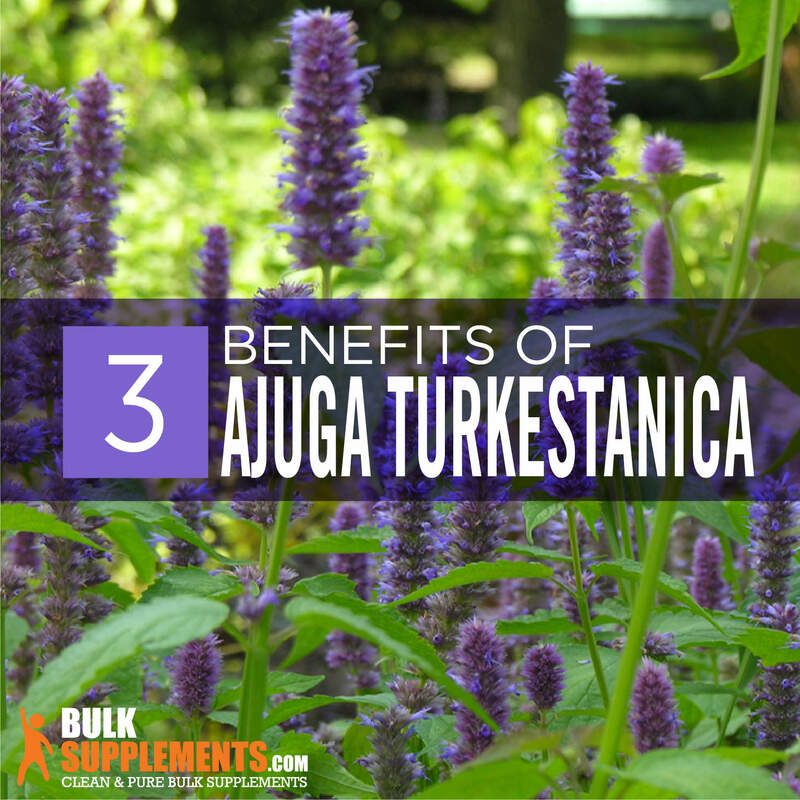 Ajuga turkestanica (ajuga for short) is one bodybuilding supplement that won’t let you down. Native to Uzbekistan, ajuga is a flowering plant used in traditional Eastern medicine. Its shoots and leaves help treat digestive upset, cardiovascular issues and general aches and pains. As a supplement, ajuga turkestanica benefits your fitness by building muscle mass, speeding up muscle recovery and improving focus. 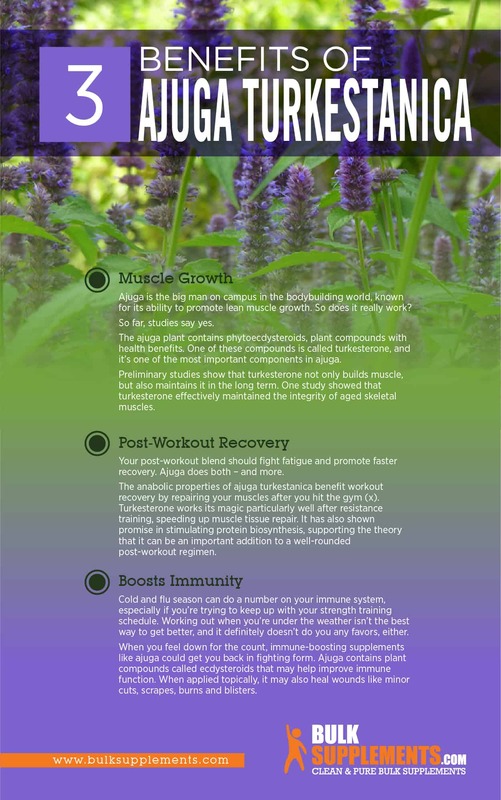 So should you add ajuga to your supplement list? Ajuga is the big man on campus in the bodybuilding world, known for its ability to promote lean muscle growth. So does it really work? So far, studies say yes. The ajuga plant contains phytoecdysteroids, plant compounds with health benefits (x). One of these compounds is called turkesterone, and it’s one of the most important components in ajuga. Preliminary studies show that turkesterone not only builds muscle, but also maintains it in the long term. One study showed that turkesterone effectively maintained the integrity of aged skeletal muscles (x)(x). From a bodybuilding standpoint, turkesterone offers a safe alternative to performance-enhancing drugs like anabolic-androgenic steroids—the scary stuff you hear about in gym changing rooms. Ecdysteroids like turkesterone are structurally different from anabolic steroids and therefore work differently, with fewer risks (x). Your post-workout blend should fight fatigue and promote faster recovery. Ajuga does both –and more. The anabolic properties of ajuga turkestanica benefit workout recovery by repairing your muscles after you hit the gym (x). Turkesterone works its magic particularly well after resistance training, speeding up muscle tissue repair. It has also shown promise in stimulating protein biosynthesis, supporting the theory that it can be an important addition to a well-rounded post-workout regimen (x). Cold and flu season can do a number on your immune system, especially if you’re trying to keep up with your strength training schedule. Working out when you’re under the weather isn’t the best way to get better, and it definitely doesn’t do you any favors, either. When you feel down for the count, immune-boosting supplements like ajuga could get you back in fighting form. Ajuga contains plant compounds called ecdysteroids that may help improve immune function (x). When applied topically, it may also heal wounds like minor cuts, scrapes, burns and blisters (x). Ajuga turkestanica isn’t just popular at the gym; it’s also making waves in the cosmetics industry. Early studies suggest it could help hydrate and moisturize skin, dry skin and psoriasis (x). As a supplement, ajuga turkestanica is available in several forms, including pills, powders and tinctures. As a dietary supplement, take 500 mg (scant 1/4 tsp) once daily, or as directed by your physician. However, if you’re pregnant or breastfeeding, talk to your doctor before taking it. Ajuga turkestanica may produce responses in the body similar to other hormones, which may be dangerous during pregnancy. Ajuga may cause digestive upset, especially if you have a history of gastrointestinal issues. Stop taking this supplement if these side effects persist. If you experience symptoms of an allergic reaction while taking this supplement such as shortness of breath or inflammation, stop taking it immediately and seek medical attention. The good news is turkesterone side effects are uncommon, as are reports of hormonal issues caused by ajuga. Still, stop taking it and seek medical attention as soon as possible if you feel it’s having a negative effect on your body. Many supplements claim to improve your performance in the gym and boost your bodybuilding results. Many are harmful (and some also illegal). But ajuga turkestanica is a pure, natural supplement that boosts muscle growth, strength and your athletic performance. 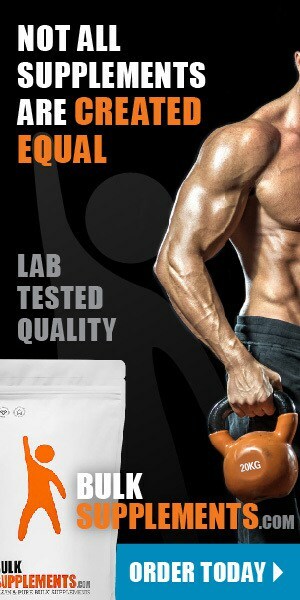 When you add it to your supplement regimen, expect to see improvements in your stamina, recovery time and muscle mass.